The NAACP filed a suit arguing the decision to end Haiti's TPS designation was "infected with the intention to discriminate" based on race. The NAACP is suing the Trump administration over its decision to end the temporary protected status for tens of thousands of Haitians living in the U.S. The organization filed the suit against the Department of Homeland Security on Wednesday arguing the decision was "infected with the intention to discriminate" based on race. 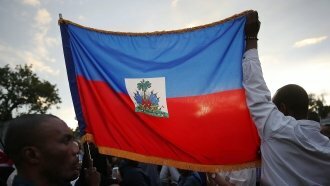 The suit estimates 58,000 Haitians could face deportation as part of the reversal. Haiti was given temporary protected status after its massive earthquake in 2010. The Trump administration announced in November it would end the status, citing its belief that Haiti has made "considerable progress" since the earthquake and that the "extraordinary conditions" caused by it no longer exist.